By looking at Earth’s full natural history and evolution, astronomers may have found a template for vegetation fingerprints – borrowing from epochs of changing flora – to determine the age of habitable exoplanets. “Our models show that Earth’s vegetation reflectance signature increases with coverage of our planet’s surface, but also with the age of our planet,” said co-author Jack O’Malley-James, research associate in astronomy at Cornell’s Carl Sagan Institute. The research, “The Vegetation Red Edge Biosignature Through Time on Earth and Exoplanets,” published online Sept. 12 in Astrobiology Journal. 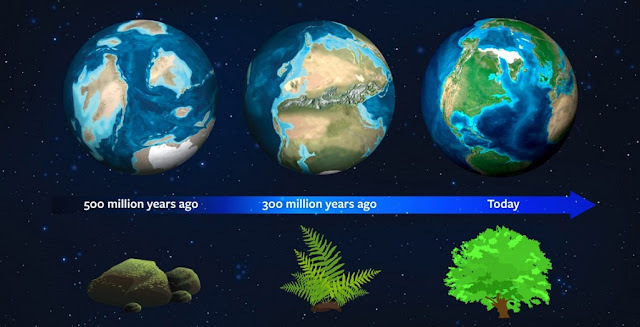 The geological record of the last 500 million years shows that Earth’s surface has changed dramatically, from being ice-covered to having huge forests spread out over land. For most of our home planet’s early history, land plants did not exist, but plants eventually became widespread on Earth’s surface. The first plants, mosses, show only a weak vegetation signature that is difficult for astronomers to find remotely, compared to modern trees. When NASA’s Galileo mission left Earth for Jupiter in 1989, the late Cornell astronomer Carl Sagan requested the spacecraft’s instruments look at Earth to see how light reflected from an inhabited, life-rich planet. Observations in December 1990 revealed a distinctive boost in reflectance between the red and infrared spectrum, just beyond the limits of human vision, due to vegetation. “The signal Galileo detected for Earth was similar to what observations of an exoplanet in another star system might look like, but, of course, Galileo was much closer to us,” said O’Malley-James.